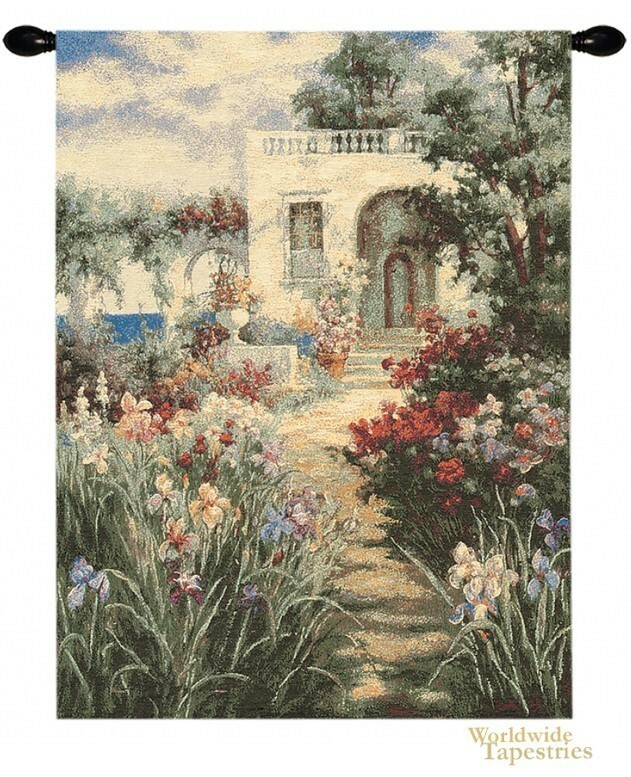 This tapestry “Patio” shows an idyllic seaside scene of a European village garden. We see lush flowers in full bloom bathed by the sun, as the curving inviting path leads the eye towards the seaside manor. Arches provide a frame for the view of the sea beyond. There is almost a sense of expectation as the imagination is led to the home. The color palette is beautiful in this piece as the violets and creams provide a wonderful accompaniment to the magentas and reds, to decorate the blue greens of the foliage. This tapestry “Patio” is lined and has a tunnel for easy hanging. Note: tapestry rod and tassels, where pictured, are purchased separately. Dimensions: W 27" x H 36"